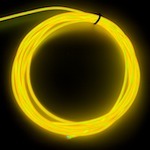 Our NEWPolar bright 3 2.6mm High Bright El Wire is TWICE as BRIGHT as the polar bright 2 EL Wire and is absolutely GREAT for an endless number of applications. 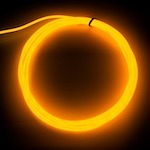 IMPORTANT - When Ordering The NEW Polar Bright 3 2.6mm High Bright El Wire With Our Current Inverters YOU NEED TO MAKE SURE you ONLY Order Half The Length Of What The Inverter Can Power. Example #1:If you will be getting our 9VDC inverter which can power 30 feet of the Polar Bright 2 El Wire.....YOU CAN ONLY POWER 1/2 OR 15-FEET OF THE 2.6MM HIGH BRIGHT EL WIRE. 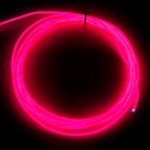 Example #2: Let's say you want to power 50 feet of our NEW Polar Bright 3 2.6mm High Bright El Wire the ONLY way you can do this is by getting an inverter that says it can power 100 or more feet. 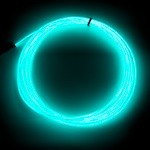 This only applies to this 2.6mm El Wire but PLEASE CALL US IF YOU HAVE QUESTIONS. 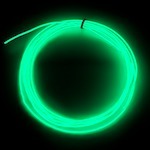 Why get the NEWPolar Bright 3 2.6mm High Bright El Wire? 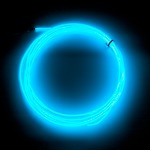 The two main reasons are (1) The NEW Polar Bright 3 2.6mm High Bright El Wire is twice as bright and (Polar Bright 2) The NEW Polar Bright 3 2.6mm El Wire can be bent and it will hold more of it shape which means less mounting points.